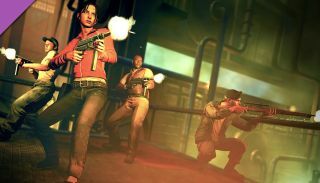 Zombie Army Trilogy, the "cult horror shooter" set in the dying days of the Second World War, now features eight new playable characters who might seem a little familiar: Francis, Bill, Zoey, Louis, Coach, Nick, Rochelle, and Ellis, collectively known as the survivors of Valve's Left 4 Dead games. "We're delighted to be able to bring such iconic characters to Zombie Army Trilogy," Rebellion Developments CEO Jason Kingsley said in a press release reported by Polygon. "As thrilling zombie shooters designed to be enjoyed with friends, Zombie Army Trilogy and Left 4 Dead share a lot of common ground." And how, you may be wondering, did eight people who, with the possible exception of Bill, weren't even born when the war ended manage to find themselves fighting in it? That question is answered in a free 12-page digital comic entitled Wrong Place, Wrong Time, which you can pick up here. The Left 4 Dead update is a freebie, too. Rebellion has also put Zombie Army Trilogy on sale for 66 percent off over the weekend, dropping it from $45 to $15 until August 24. Hit up Steam for the details.